Derin Oloyede has enjoyed many different BMWs over the years, but few have impressed him enough to keep. 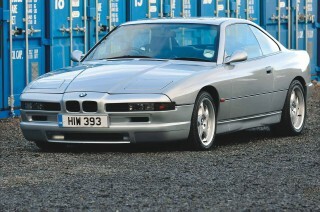 As Chris Graham discovers, though, this fine E31 BMW 840Ci Sport is a different matter. We sample an owner's low-mileage beauty Third time lucky! As regular readers will probably remember from the article we ran last summer (Two of a kind), Derin Oloyede is somebody who has taken his enthusiasm for BMW to considerable heights. He’s owned nearly 30 models over the past 20 years, buying, restoring and selling most of them as an antidote to his busy and stressful career in medicine. The majority of those cars have come and gone in fairly short order, but some models have struck more of a chord with Derin than others. The brace of Z4s we featured last year are a good case in point, but so is the car we’re spotlighting here. “I bought this particular, 1998 BMW 840Ci Sport E31 almost 13 years ago,” Derin explained to me as we sat chatting inside the car’s well-appointed, still immaculate and beautifully-finished interior. 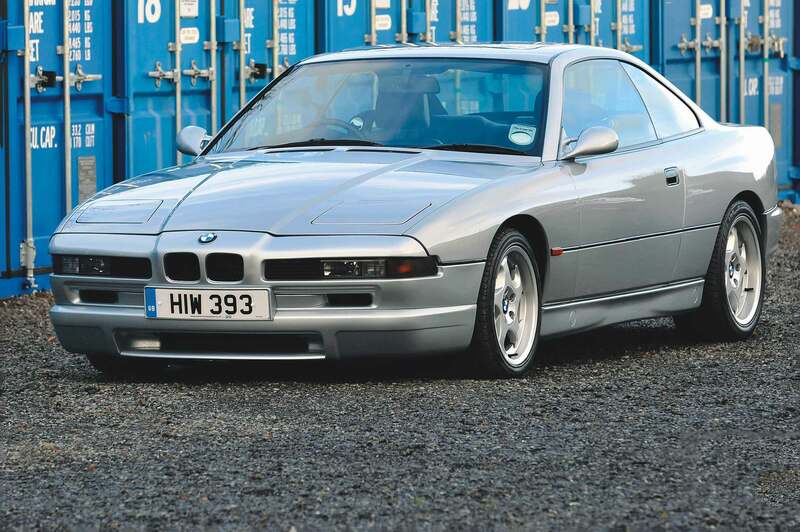 “It’s actually the third silver 840Ci that I’ve owned, and it’s certainly the best. “It was spotted for sale on eBay by an 8 Series-owning friend of mine, who noticed it because of its incredibly low mileage. But given my history of buying ‘unnecessary’ BMWs on a whim, I vowed not to look at the advert,” he recalled with a knowing grin. “Inevitably, though, my resistance crumbled and, when I checked the advert, I found a car that looked virtually immaculate. Better still, it had covered just under 25,000 miles, and I was immediately very tempted. But, the reality was that I really wasn’t in a position to buy it; and then there were the problems associated with explaining yet another purchase to my wife! “The panic and frustration spurred me into action as I scrambled to get the thing booted-up again and, during the few minutes it took for that to happen, I decided to make a bid. The rest is a bit of a blur, to be honest. The laptop restarted with barely enough time for me to rush in a bid, but I managed it with 10 seconds to spare, and I won the auction by just £5! The car was held by a broker in London, and when Derin got down there to see it a few days later, everything about it exceeded his expectations. The difference between it and the higher-mileage cars he’d already owned, was palpable and inside seemed like a new car. “Both my previous 8 Series were the same colour and model as this one; Arctic silver with black leather interiors,” Derin told me. “The first was a 1997 840Ci that I’d bought on a complete whim, in 2003. 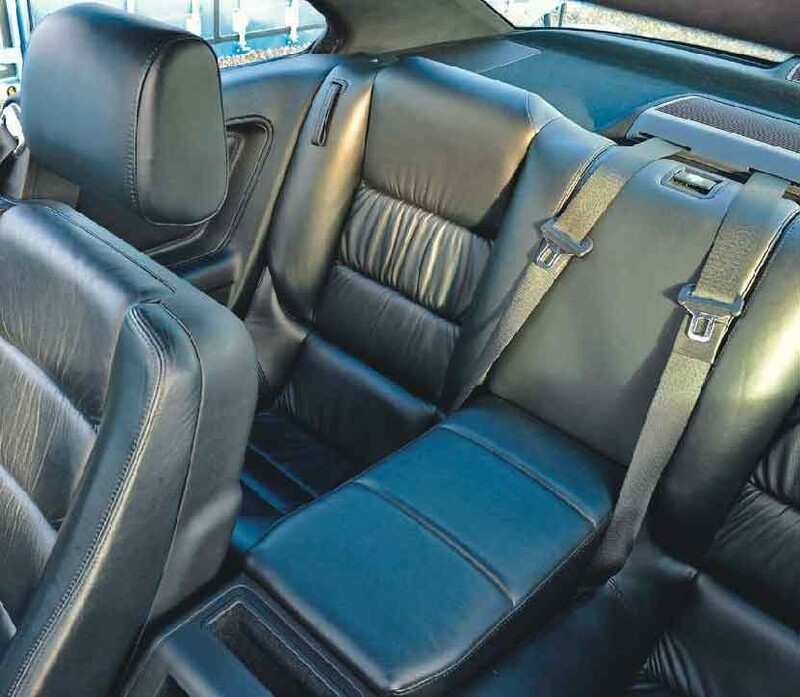 It was also on eBay and something just made me buy it – I hadn’t been looking for an 8 Series, or really even considered the model at all up until then. “However, although I didn’t use that car very much, it did begin to grow on me as I worked through it, putting things right and preparing it for resale. It had covered 64,000 miles, and I wanted to bring it up to perfect condition before moving it on, so had it resprayed. “In those days, I was buying and selling quite a few BMWs, and very much enjoying the process of returning them to a showroom-like condition before selling them. As long as I didn’t lose money on the process, that was fine by me; it was a hobby for me and the renovation process was the aspect that I really loved. “I replaced that first 840Ci pretty quickly, with another of the same model; it was a 1998 car with 74,000 miles on the clock, and a higher-spec that included luxuries such as headlamp washers, electric rear window blind, heated seats and cruise control. That car was another internet purchase, and came from an enthusiast who was more into Porsche 928s. I kept it for about eight months, had it resprayed, the wheels refurbished and, once again, didn’t use it very much. This was the one that I still had when I bought the current car, so it just had to go as I certainly couldn’t justify keeping two of them! Rather sadly, though, Derin received a call from the new owner the following day with the news that, once back in Aberdeen and while out on a birthday celebration, he’d nosed the car into a rock and split the front spoiler! But that was repaired (at considerable cost) and the owner went on to enjoy many years with the car. “He drove it all over the place,” Derin told me, “often going to France and also on trips to Poland and other Eastern European countries. In the end, he sold it to somebody in Belgium who, by complete coincidence, I stumbled across on the internet a few years later. The E31 8 Series is widely regarded as a troublesome car to own these days. It’s a model that labours under a reputation for being over-complicated and, consequently, unreliable. You hear countless tales of people who have spent fortunes on repairs and general maintenance, just to keep their cars running. Interestingly, though, Derin has a different view. 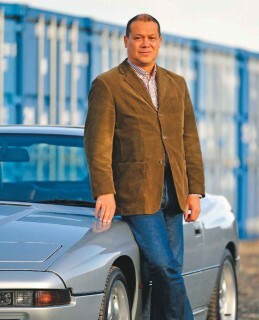 “I think that the reputation the 8 Series has as an unreliable money-pit is unfair,” he told me. “In my view, a lot of the trade took against the model when it was launched, because most of them didn’t have the know-how or the diagnostic equipment needed to deal with it properly. 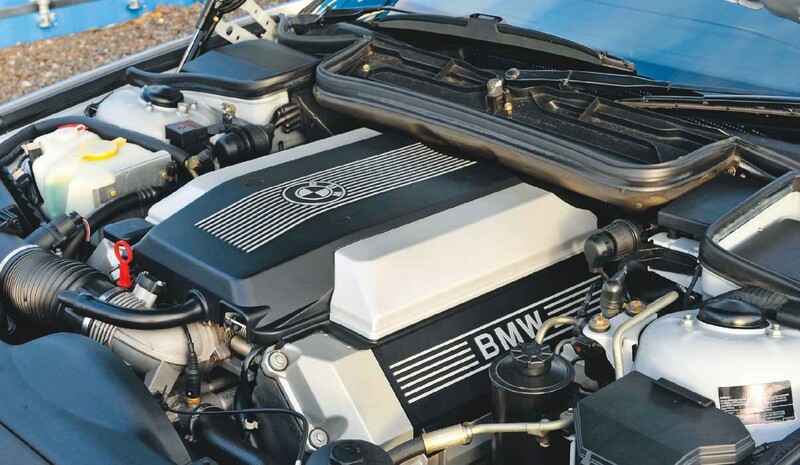 In reality, though, I don’t believe that the E31 – especially the V8 models – are very much more complicated than an E38 7 Series, or even an E39 5 Series. “I’ve now owned three E31s and haven’t had to deal with any serious mechanical or electrical issues, whatsoever. So, I think a lot of the problems stem from people messing about and fitting aftermarket alarms and radios, or making other modifications. My cars have all been standard, and I’m convinced that this has made a significant difference. That’s not to say that I haven’t had a few problems, because I have, but they haven’t really been technical in nature. In fact, I think that it’s simply the age of the cars – and their lack of use – that have triggered the trouble, rather than design- or complexity-related issues. “For example, I had a problem with one of the catalytic converters a few years ago; the core simply disintegrated. This didn’t trigger a dashboard warning light, but caused a noticeable misfire under hard acceleration. So, I had both cats replaced (£600 each) and, as the rest of the exhaust system was in good condition, these were simply welded into place in the original pipework. So Derin’s experience doesn’t fit with all the anecdotal doom and gloom typically heaped upon the E31 8 Series. Admittedly, he hasn’t covered great mileages in any of his three 840s, but the second of his cars certainly did, once he’d sold it; and it’s still going strong today. Perhaps, then, the original 8 Series simply fell victim to the mechanical foibles of the admittedly complex, range-topping 850CSi model. In reality, it could be that the simpler, V8- powered models represent a much better ownership proposition than most give them credit for. “When I bought this 8 Series – my third – I got it with the idea of keeping it longterm,” Derin explained. “Even though I was still doing quite a lot of spare-time car buying and selling at that time, I just knew that this was a car that I wanted to hold on to, and so it’s proved. After all, what else is there that could provide the same, appealing mix of performance, luxury and striking road presence? At one point, I did toy with the idea of a Porsche 911 996 Carrera which, about 10 years ago, was available for about the same price as an 840Ci. Talking with Derin more generally about his 8 Series, he revealed that it’s soon to become the car that he’s owned for the longest time. “Many years ago, I had an E9 3.0CS which I kept for 13 years, so this one’s getting very close to eclipsing that now. One of the aspects that I really love about the 8 Series is the fact that it’s so different from anything else. Even today it still looks great, and certainly stands out from everything in the BMW range. “I think that BMW has missed a trick with the new 8 Series, simply because it looks too much like just another, modern BMW. It doesn’t have anything like the road presence of the E31, and isn’t distinct enough for a flagship model, in my view. I’ve had a passenger ride in an M850i and, granted, it’s astonishingly fast. But it seems like a big car when you’re in it and, from the outside, it just doesn’t have the necessary visual impact. “I was never tempted by the V12-engined E31 models. There certainly isn’t very much to be gained from the basic 850i, compared to a V8-engined car. The V12 only produced 14hp more, but was much heavier. Of course, the CSi variant had an S70 5.6-litre, V12 engine, which was a different kettle of fish and a good deal more powerful. But that model features complex rear-wheel steering, and really was something of a tech-fest. Although BMW produced more than 30,000 E31 8 Series models, only just over 3,000 of them found their way into the UK. About two-thirds of those were V8-powered cars and, of the remainder, nearly 700 were V12 850is and just 153 were the high-performance, CSi variant. So, the model was far from a great seller here but, arguably, that poor showroom performance is what’s now stoking the car’s desirability levels, some 20 years on. It’s clear that Derin is now a real fan of the model, and his appreciation of the 8 Series has come on in leaps and bounds since his initial, unenthusiastic reaction to the first car he bought. While the growing value of his 840Ci Sport is a significant factor to him, it thankfully doesn’t detract too much from the pleasure he gets from driving and simply owning such a distinctive and rare vehicle. Right: Pop-up lights were another stylish feature, and they move up and down silently; impressive engineering. 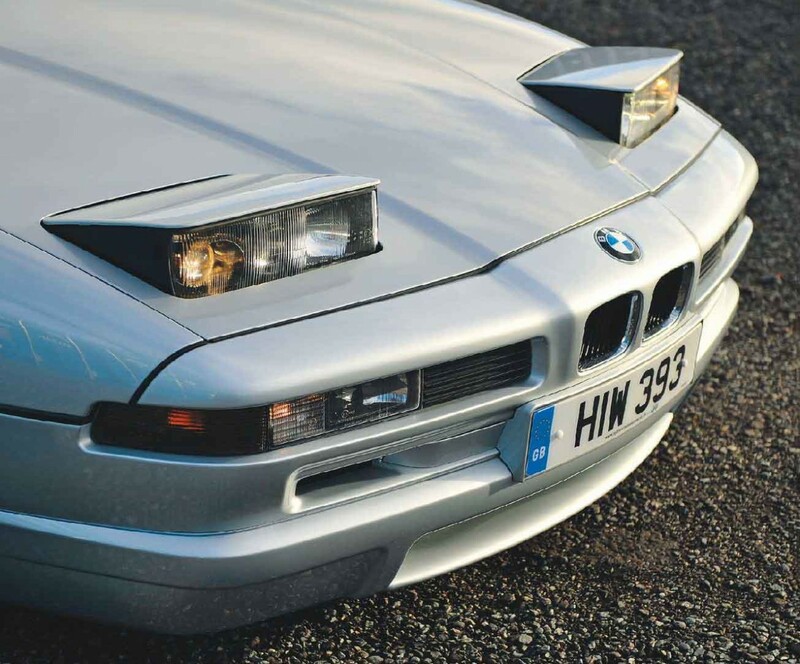 These housings contain the dipped and main beam projector-style bulbs, as well as fog lights. The lights seen inboard of the indicators are secondary main beam units. This 840Ci Sport model features a deep front air dam, side and rear skirts, as well as a distinctive door mirror design. 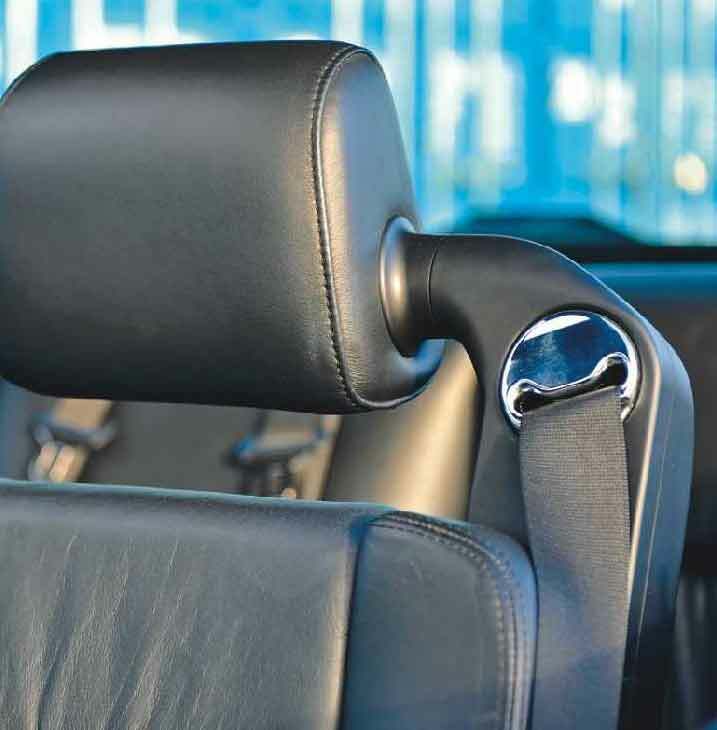 Left to right: The unusual, single mounting arm for the front seat headrests is both adjustable and contains the inertia reel mechanism and top mounting for the seatbelt. Consequently, the seat backs are very strong! • The rear seats offer just about enough legroom for small children, but can be folded forward for additional storage space. 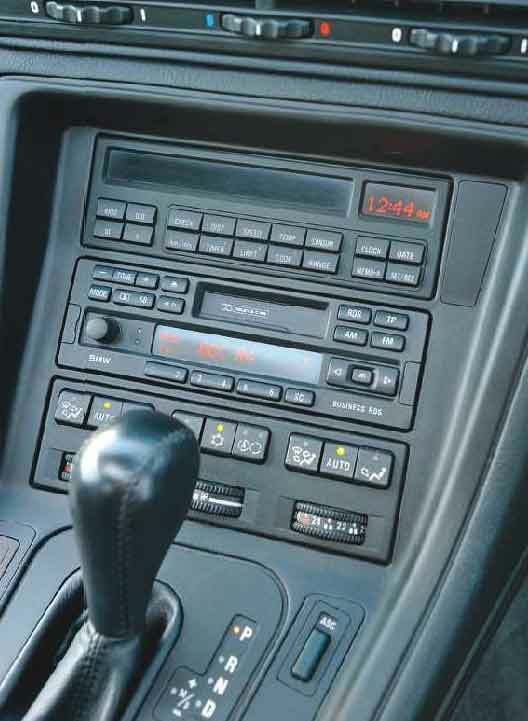 • In true 1990s style, there are lots of buttons in the E31! Derin’s Sport model features a Steptronic automatic transmission, so gears can be changed sequentially using the lever, if desired. • The E31 presents classically clear, BMW instrumentation, with overlapping main dials. Just about the only aspect shared with the much loved E24 coupé was the stylish, pillarless window design. In this case, the rear windows drop and rotate to withdraw fully from view. The mechanism that achieves this is unique to the E31. They close automatically at 100mph. 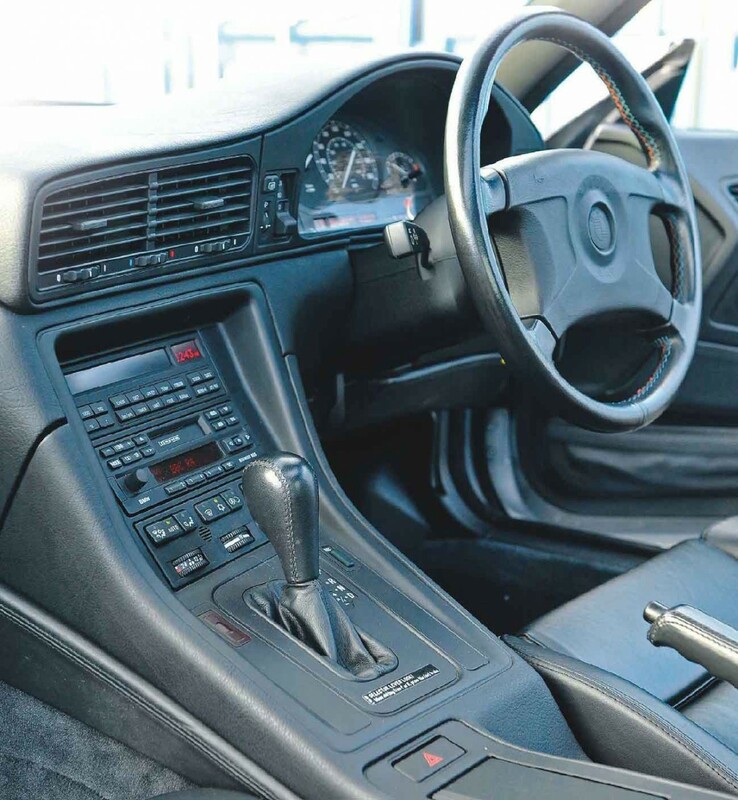 The E31 was the first BMW to feature a steering wheel-mounted airbag, which explains the lack of a blue and white badge at the centre. The 286hp M62 4.4-litre V8 replaced the 4-litre M60 (also used in the E32 7 Series). It’s an essentially reliable unit. Sharply-styled from every angle, the E31 8 Series has aged well. Note the just-visible quad exhaust tailpipes. Derin Oloyede’s 840Ci Sport is a later, M62 4.4-litre V8-engined model; this motor was used from 1995 onwards. The car is also fitted with the desirable, three-piece, Style 21M ‘throwing star’ alloy wheels. 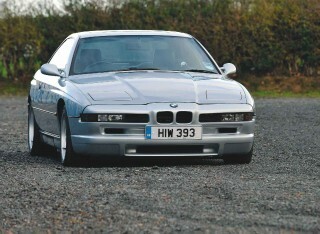 Derin says that this 840Ci – the third E31 8 Series he’s owned – is a definite keeper.